No, Mr. Terrall. I am not a student of human nature. I am a professor of a far wider academy, of which human nature is merely a part. All forms of life interest me. Ahh, after the stagnation of The Faceless Ones, Evil of the Daleks seems like such a breath of fresh air. Its not perfect by a long shot but there is a fairly involved, if somewhat hole filled, plot and some great ideas at play here (in fact Daleks in Manhatten pretty much tells the same story!) There are some real high-points in the Doctors mythology here. The clearly stated fact that he is not at all human and his cold manipulation of Jamie are two of note. I am certain that if this story existed in its entirety it would have been spectacular. instead it is slightly less hard work. The civil war is wonderfully handled (although I don't know why the "Human" Daleks were not destroyed right away) and I still get chills hearing the Emperor scream "DO NOT FIGHT IN HERE"
So we say goodbye to series 4. 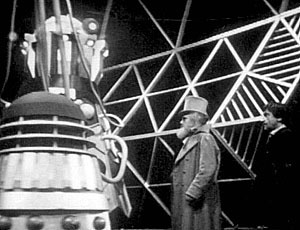 Onwards and up to series 5 and an encounter with another old foe... in motion!